On the evening of March 3, 2018, my husband and I were watching television when we heard a series of bangs. Looking out the window, I saw fireworks. We thought some local festival was going on. We live in Hamilton, Ontario, Canada, a city/region of 530,000 people about 60 kilometers west of Toronto. Hamilton was formerly a steel town and still produces steel, although its main industries now are education and health services connected to McMaster University. If you’ve ever driven from Buffalo to Toronto, you’ve passed our smokestacks. Torontonians used to pity people who lived in working-class Hamilton. Lately, however, Hamilton has been coming up in the world. My husband and I live half a block from “trendy Locke Street,” as the real estate agents put it. Locke Street is the shopping street in a popular area of Hamilton known as Kirkendall, consisting of one-family homes, duplexes and triplexes, and a few apartment buildings. The two elementary schools and one middle school in the area have good reputations. The average income is higher than the average income of Hamilton as a whole, but hardly the highest in the whole region. It’s now a popular area for people fleeing Toronto’s high real estate prices. 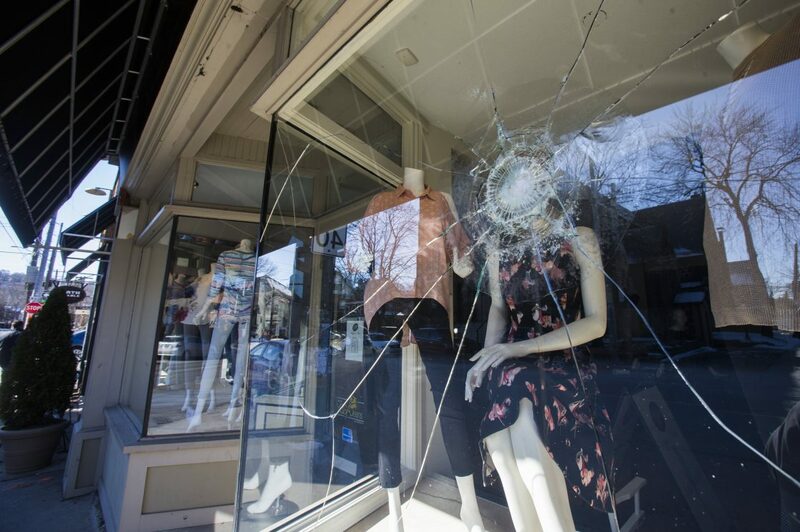 The bangs we heard on Saturday evening were made by a group of about 30 people, dressed in black and carrying a banner saying “We are the Ungovernables.” They were setting off fireworks and throwing rocks and eggs at businesses and cars on Locke Street. When the police arrived, they dispersed down side streets, shedding their black clothing. Residents of Kirkendall enjoy patronizing the many shops and restaurants on Locke St, and attending the several churches. My husband has his hair cut by Mr. Tony, the son of Italian immigrants, and sings in the choir of St. Joseph’s Church. I use a tiny branch of the Hamilton library, usually on my way home from the Locke Street Gym. We buy pizzas at Earth to Table, a locavore restaurant, and other food at Goodness Me, a health food grocery. Except for a Starbucks, presumably locally franchised, my guess is that every restaurant, beauty salon, physiotherapy service and shop on Locke Street is locally owned. Ron Mattai is co-owner of Mattson’s, a popular Locke Street restaurant that opened a few years ago. Some years ago, when Ron owned a restaurant near Hamilton’s Theatre Aquarius, a gay-basher brutally attacked him with a broken beer bottle. Ron required four surgeries and still does not have proper feeling in his face. Mattson’s was spared window damage, but some of the Ungovernables threw eggs when they saw patrons looking out at them. The patrons were so frightened by the noise and people in black that they hid under the tables. Prue is the owner of Pippa and Prue’s, a women’s dress store. One of her plate-glass windows was broken. She asked me why I thought the Ungovernables had trashed her window, and I replied that they probably thought she was a capitalist pig. If so, Prue laughed, that had backfired; her business would probably pick up. When I went into the store two women had dropped in to offer support. One said she’d never shopped there before but would do so now. The worst hit store was the Donut Monster, which a youngish local couple opened a few months ago. Nine of their windows were boarded up. On Sunday morning they were offering coffee but no dough-nuts, yet even the loss of one Sunday’s patronage might damage their business. But by Sunday afternoon people had lined up around the block to buy coffee to show their support, and the plywood boards on their windows were covered with messages, of which the one I liked best was “make donuts, not war.” The Beverley, a breakfast and brunch place, was also boarded up. The “Ungovernables” who trashed Locke Street probably think of themselves as anarchists. Their tactics suggest they’ve studies “antifa” (antifascist) groups elsewhere. They might have been attending an anarchist book fair that has taken place peacefully at a local high school since 2010. Some may have been locals, others from out of town. This was no spontaneous, anarchistic event, though. The rock-throwers had probably not spontaneously gone to the local balaclava store to buy their face coverings, and their banner was quite professionally made. These Ungovernables probably think they’ve struck a blow against capitalism and the local bourgeoisie, the latter represented by the families who live in the Kirkendall neighbourhood. Apparently some of Hamilton’s local anarchists have been protesting the gentrification of other neighborhoods for several years. But on Sunday morning Locke Street was crowded with people, many popping into businesses to offer condolences and support. On March 10 there will be a march of local people in support of these businesses. In their defense, I originally thought, the Ungovernables attacked property, not people, seemingly careful to throw eggs but not rocks at restaurants where patrons were still eating. But since then I’ve learned that they had earlier congregated at a local park and thrown rocks at three police officers who turned up to investigate. You can kill someone with a rock. All the Hamilton Ungovernables have achieved is to provide ammunition for the political right. The Ungovernables may be young people fed up with what they see as establishment politics; they may also be confusing Canadian politics with the corruption and kleptocracy that characterizes President Donald Trump’s government in the United States. But their actions support the false equivalence of left-wing to right-wing activists that supporters of the very capitalist status quo that they want to overcome use to shut down reasonable political debate. The more the political right can accuse the political left of violence, the greater the chance of delegitimizing the left. What the Ungovernables should have done was stage a peaceful march, then answered questions from local people and the press to get their point of view across.